Yes, it is early to talk about Christmas. No, I am not a person with their tree up already. But this is a blog about living more, buying less, and spending our money on things that do some good. All of those concerns will loom large the next few months. Plus, etsy purchases take time. So, let's get started. Don't put your tree up yet, but it's time to start talking. We as Christians love to bemoan the ways the Christmas message has been lost, and I can't help but agree. Look at it this way. Thousands or even millions of people with no religious affiliation celebrate Christmas every year. No church, no nativity, but otherwise, does their Christmas morning look any different than yours? Gifts, carols, a tree- aliens looking in might see little difference. To put it bluntly, they prove you can celebrate Christmas without Christ. If it's already been established you can gift without Christ, shouldn't Christians consistently prove you can celebrate Christmas without so many gifts? Without shopping? What do sales (Go away Black Friday), piles of gifts, or shopping lists have to do with Jesus? If it is just one symbol among many, could your family just do a Christmas without shopping, stuff, or gifts? If deep down you can't say yes, then we have somewhere to start. Americans love the visual affirmation of abundance. It's not our best quality. I know I love to see a mountain of presents under the tree- gifting is my love language, and I can't help but send the message "HOLY CRAP I LOVE YOU SO FREAKING MUCH" this time of year. I think that big pile can also tell people that they are doing ok, that they are providing, that their kids are happy, etc. When life gets hard, it can be a signal things can still be good. But as much as I get the instinct to celebrate this way, the way I see Christmas gifting is radically changing. Our gifting mirrors the gifts of the Magi, but on a deeper level, it mirrors the gift God gave the Earth- his son! He did the ultimate good for the world by giving this gift, and I truly believe we should try to model our gift giving after this. Instead of looking for a deal or making sure each child has an equal pile of goodies, could we ask "How will this gift do good?" A gift that does good changes the criteria from which we make our choices- it's no longer "will he like it?" or "will this be enough?" or "can I find this cheaper?" Shopping to do good means buying fewer things, because abundance is waste in disguise, and you can't be thoughtful about 100 things at once. For each gift, it means paying attention to how the object was made- "was the person who made it treated with respect?" It can also refer to how it was sold- "does buying this help my community?" It could be about the environment- "Does this gift create more waste for landfills or use a ton of energy getting here?" By paying attention to these issues, we shift our gifting paradigm, and we can make a profound difference in this world and in our families. Consumerism in America is out of control. In 2012, they estimated an average American spends 846 dollars on gifts for Christmas. That's a ton of money! This means, Christmas is one of the most important times to think about making a positive difference with your shopping. People have too much stuff already, and it takes away from our lives. It also destroys our landscape. Our gifts create landfill waste and use tons of fossil fuels. Committing to buying less but better, less plastic, practical, and more local gifts can change the world. Especially if we all make this change. We often hear cliched statements about how Christmas isn't about gifts or spending, but that is honestly easier said than done. This blog aims to give some actual strategies about how to make Christmas great without so much stuff. Buy Less. Don't buy 3 cheap gifts. Buy 1 meaningful one. Don't get stuck with that picture of the tree in your head, and spend money on non-physical gifts like gift cards for dinner out or tickets for a cool experience. Make something yourself. Buy Used. Fight the stigma against used items. You can find an amazing pair of boots or kitchen items at a steal just by starting at consignment shops first. Check you Buy Nothing Project. Look for toys or items that use post-consumer recycled materials. Buy Local, Buy American. 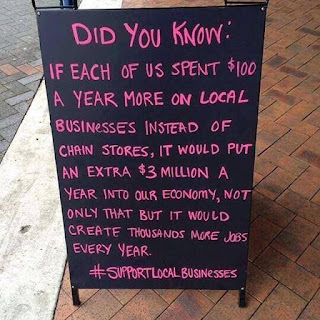 Support your community and your country by shopping at locally-owned stores instead of Walmart and Made in America items instead of things made elsewhere. Just stay out of big stores like Walmart and Target this season. Is local and American more expensive? Yep. But if you buy fewer gifts and fill in the blanks with used items, it can add up to about the same. You are just spending your money in a different way. This is a huge commitment, but you can break it into sizes that don't overwhelm. I am not suggesting you have to do this for every gift (even though it would be cool if you did). Make a plan, make a list, and figure out which things you can do this for. You can even think about how to change what you ask for when people ask. This is all about baby steps, and if you think about it at all, then that is pretty damn awesome. You could try making part of your gift this year. 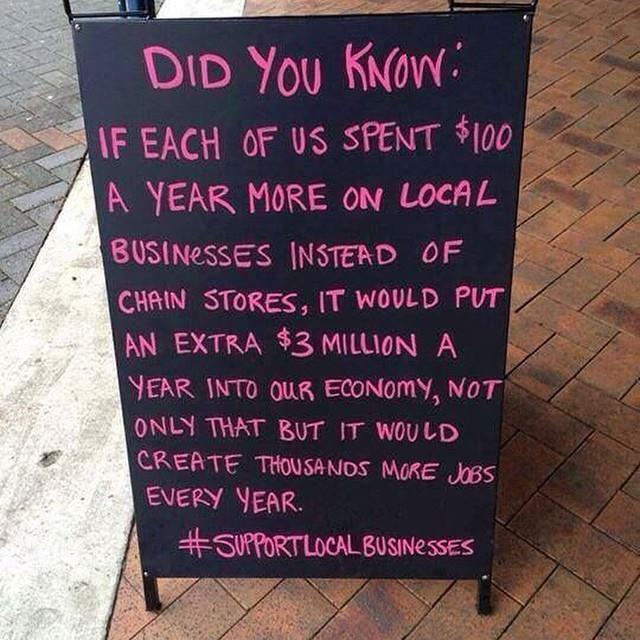 Or just start your shopping at local businesses and thrift stores. You could rethink what you really need and will ask for yourself. Every Christmas season, we shell out oodles of money to buy gifts for all our loved ones. If we all did commit 100 dollars to local businesses, or things manufactured in America, or recycled/ used gifts, we could make a HUGE difference! So the blog in November and December is all about inspiring a new approach to Christmas shopping. One where we can finally accept it really is the thought that counts, not the money spent. Most importantly, this is totally doable. I am going to post more friends and family wishlists (throwbacks from last two years and new ones- people send me your lists! ), so you can see that you can get almost anything recycled or Made in America. I am going to post ideas of how to wrap in a more eco-friendly way (how can we wrap creatively to make the wrapping part of the gift? ), and even more stocking stuffers Made in America (therefore, using so much less fossil fuel!). I am going to research Christmas pajamas and where you can get local, American-made candy all over this country. You can get your Christmas cards recycled. I have some awesome Etsy lists for you (I do love some Etsy). It does not mean that you should let consumerism take over your season starting today, and PLEASE save the Christmas music until after Thanksgiving! But making big changes is hard, against the grain of cheap, fast, and easy, so give yourself time to rethink the game. I am also really into the idea of giving as a family tradition, so look out for Advent giving plans and ideas of where and what to donate this Christmas (some of the big organizations, like Operation Christmas Child, have major problems, but that doesn't mean they all do). If you care about stewardship and you want to make your Christmas about more than sales at the mall, resolve to only buy things Made in America or fair-trade. If you care about the environment, think about how you can create less waste this season! There are so many great ideas out there. The amazing thing is, if you care about one of these things, you will make a positive change for all of them. If a company cares about these things, not just about making the most money possible, they often attend to other ways to do good as well. Putting your money there sends mainstream companies the message that if they want your money, they have to do better too, which is a pretty awesome message for us to send (over and over). You don't have to make it impossible for yourself, just join me in trying to do better this Christmas. And let me know about what you are finding, what you are looking for, and what purchases you are most excited about! This was an interesting read. I like your look on things especially because It's tight this year. Good read. We certainly don't over shop but I get what your saying. People get ridiculous over the holidays and it doesn't have to be that serious. I do focus on less toys because they have plenty and we don't need the latest toy that's going to be played with 3 times. Such a great message! No one in my family needs more stuff this year! As a small business owner, I wish more people would buy local or buy small not corporate but I know it can be hard with kids and toys/electronics. This is a great message!